Where is Ireland’s Talent? We’ve (literally) mapped it out for you! We’re excited to release Ireland’s first Interactive Talent Heat Map – showcasing the talent and skills nationwide – and not just in major cities! Following intensive data mining, analysis and tracking of our +20,000 smart working members – and thanks to some great design work by TheInformationLab.ie – Abodoo is excited to reveal our first nationwide interactive talent map outlining exactly where the talent and skills are across the country. What is a Talent Heat Map? Talent heat maps are geographical representations in the form of interactive maps and infographics showcasing the wide range of skills and talent available nationwide, in rural areas, villages, towns and cities all over Ireland. By hovering your mouse over each county, you will see what the most prolific skills are in that area – neatly broken down by percentage. This information enables companies and employers to identify where the skills they require are and where they can hire, set up secondary locations or relocate to. It will also help SmartWorkers to secure roles where they live as opposed to moving and commuting to larger cities. These insights will enable forward thinking employers to making future hiring decisions based on skills and not location, enabling them to grow and scale effectively and more cost effectively, without high levels of investment, with the added benefit that they are contributing to the country’s rural regeneration and prosperity outside of major cities such as Dublin and Cork. Why Are Talent Heat Maps Needed? Companies are struggling to find, attract and retain skilled talent. We know that there are large pools of talent country-wide that have not yet been tapped into, due to the fact that lots of Foreign Direct Investment (FDI) and recruiters prioritise larger cities. An individual, for example may be an extremely talented Web Developer living in Galway – but does not want, or is not able to relocate to Dublin for personal or economic reasons (e.g. extortionate rent prices, or family commitments). By highlighting the location where skills are available, we can provide employers access to talent pools available outside of standard commuting distances, thus increasing their access to skills. 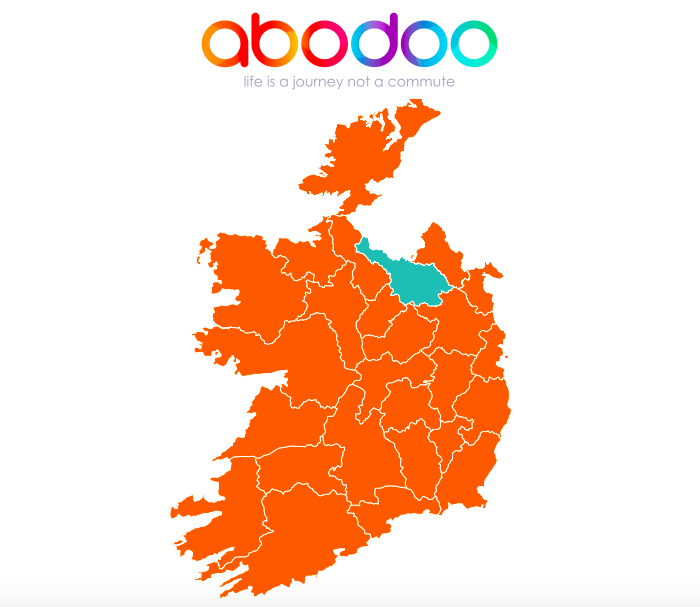 The Abodoo community is made up of skilled professionals all looking for Smartworking options; they want to work from home or close to home and the growing network of co-working spaces – all with high speed broadband – enables businesses to tap into this talent – have them working within their own home or communities and reduces the capital investment generally associated with secondary and even tertiary sites. Soaring property and rental prices, along with increased demand on city housing and the lack of affordable office space, restricts companies from expanding and scaling their business at the speed often required. Enabling flexibility through a smart working model means that businesses can expand without these constraints and if location is not an issue then the talent pool really opens up Ireland and not just Dublin and Cork. We want everyone to be included in our #SmartWorking movement, regardless of geographic location. This is extremely important to us, to rural and urban communities and society. In conjunction with our SmartVillages initiative, we aim to promote rural areas to companies as the place to be! Sligo, for example, is home to lots of skilled workers in the Tech sector. Our heat map will showcase these tech skills so potential tech investors can see where best they can set up. Increased FDI will in turn contribute to economic prosperity in the area, create a buzz in rural and urban areas and encourage diaspora to return home. By connecting with government bodies such as Enterprise Ireland & IDA, we hope to support Irish companies and start-ups on their quest to hire the best talent Ireland has to offer, attract investors and #GoGlobal. We do this by facilitating meetings between relevant parties, co-working hubs and local enterprises. From reduced carbon emissions, improved diversity and inclusion, mental health and personal time.. the benefits of are endless! We have been producing talent heat maps since early 2018, just after we launched, for government bodies, IDA and local county councils. In 2019 we are now officially the largest SmartWorking community in the world and are now rolling out this service to companies and multinationals interested in finding and sourcing talent. For more information on any of the above, please do not hesitate to contact us. Design by The Information Lab Ireland: a Gold Partner of Tableau & Alteryx in Ireland. We will help you create a clean, efficient, repeatable and governed data-strategy and show you how you and your team can gain cutting edge insights from your data. We believe that every organisation can better harness their data to reduce costs, increase efficiency, create wealth, build better companies and increase their employees’ sense of purpose.